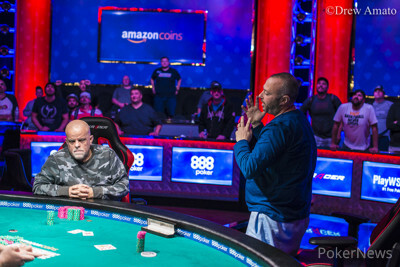 After a fascinating encounter on the final day of the Event #21: $1,500 8-Game Mix 6-Handed, Ron Ware has emerged victorious to earn his first WSOP bracelet along with a $145,577 first-place prize. Remarkably, Ware entered the tournament defending his third place from last year's edition. This time, he left the 472-strong field behind. Ware explained the importance of staying focused all the way through the long journey that leads to the famous gold: "It's just a slow grind. Just gotta be patient and wait for chips. You can't chase chips that don't belong to you," he said. "I like the mixed games because usually, you can catch a couple of the games people are weak at. I like the mixed the best because it gives everybody a shot to be bad at something," said the champion. Ware came back for the final day second in chips but he soared to the chip lead in the fourth level of the day with players already seated on the feature table. Ware won a huge three-way pot in stud hi-lo when Chris Vitch bet-folded on the seventh street and Fabrice Soulier check-raised with two pair on his board. Ware had aces in the hole in addition to his exposed threes, scooping the giant pot to vault over one million in chips. Since then, Ware controlled the final table, extending his chip lead to sit even more comfortably in his chair. He had nearly half of all chips in play with five players left and with the progressing levels, he was becoming clearer and clearer lock for heads-up. When asked about whether his approach to the final table changed when he gained the commanding lead, Ware replied: "Not really. I still stayed out of trouble, still waited for good hands." One of the main stories of the final day was Chris Vitch, who came back with the second shortest stack but he quintupled it during the first level. Arguably the most feared mixed games player on the final table, Vitch couldn't eventually reach better than a fifth place finish. Vitch lost his chips to Ware in a no-limit hold'em hand, shoving from the small blind with queen-ten only to run into Ware's pocket jacks. Vitch collected $27,142 for his efforts, topping his $23,827 payday from last week's tenth place finish in the $10,000 Omaha Hi-Lo Championship. Vitch's exit wasn't followed by any elimination for the next hour of play, but Ware took care of Sachin Bhargava soon after dinner break in a razz hand, sending him to the sidelines in fourth place worth $39,545. 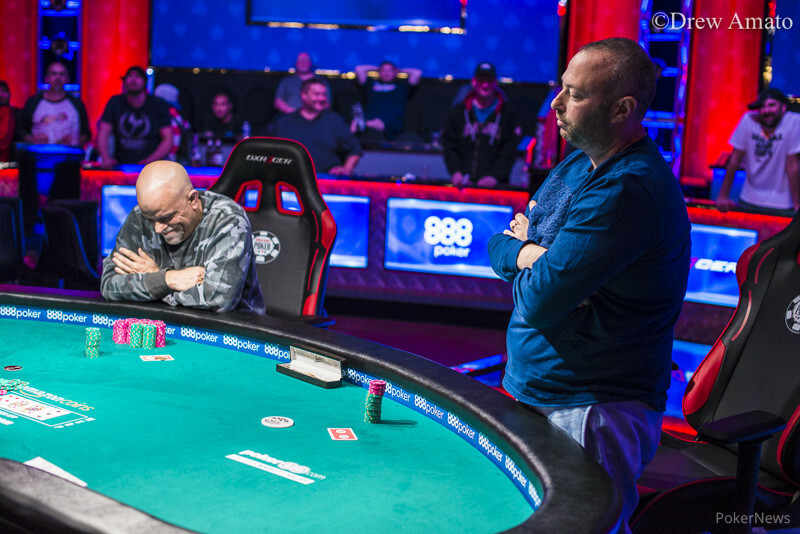 While Ware had a paved way to heads up, Fabrice Soulier and Mike Ross were getting short and they battled it out for the other chair for the final showdown. They clashed twice in no-limit hold'em, and while Soulier doubled in the first round, the second belonged to Ross who knocked out the French bracelet winner in third place, leaving him with a $58,968 prize. Ware was a huge chip-favorite entering heads up with about a five-to-two lead. Ross, however, proved to be a tough obstacle. He managed to narrow the gap and even gained a slight lead at one point, but Ross' tally featured many up-and-down swings and Ware would soon magnify his chips back. The most remarkable hand during heads-up emerged in stud when Ware called a bet on the seventh street with just ace-king high, correctly picking off Ross' bluff. "The way I looked at his board, it just looked to me like he was going to have a flush or nothing. I just can't picture him betting a pair in that spot. It didn't look like he was dragging with a pair, it looked like he had some kind of draw. So, I figured he either made his draw and he's getting one more bet, or he missed his draw and I'm gonna get the pot," revealed Ware his thought process during the hand. Ross, however, remained relentless, bravely chasing his first bracelet. He doubled three times, but the fourth one wasn't meant for him. 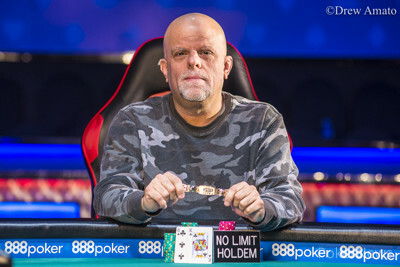 Ross' fate as a runner-up for $89,948 was sealed in no limit hold'em, with Ross calling all-in on the turn with a flush draw and an open-ended straight draw against Ware's top pair. The river missed all of Ross' outs to play his swan song and decorate Ron Ware the $1,500 8-Game Champion. Mike Ross checked his big blind after Ron Ware limped in, and he then check-called a bet on . Both checked the , and the river was a . Ross checked and Ware bet. Ross called after some thought, and Ware turned over for two pair. "So sick," Ross said, showing . "He was dead to a nine." Ross raised to 105,000, and Ware called. On the flop, Ross bet 175,000 and Ware called. When a arrived on the turn, Ware simply moved all in. "I don't know if I can fold this," Ross said as he stood out of his seat. "I got a big draw, buddy. And I love a draw." Ross decided to call and turned over . Ware held , so Ross would need a heart, nine, or ace to survive. The river was a though, and Ross' sizable rail went quiet, as Ware locked up the tournament. One hand has passed since the last update, and the situation is completely different again. Ross took his lost chips in the second hand of Omaha 8. He doubled with , spiking the top two pair on the board. The heads-up thriller continues on. It's been a roller-coaster heads up for Mike Ross. Just after he doubled, he dropped back down to under 500,000 in chips. "Wow, I got scooped here," he said after the showdown with the board reading . While the flop was checked, Ross paid one bet on both turn and river. Ware opened a nut-low and his pair of sevens was enough to seize the high, too. Mike Ross completed with the and Ron Ware called with the exposed on his board. Ware's three paired on the fourth street and they ended up all in right there. Ware had sixes in the hole and was ahead with two pair. Ross couldn't improve through the sixth street, and was one card away from elimination. Ware turned over on the seventh so his hand remained sixes and threes. Ross peeked at his remaining card and then jumped in joy: "Aces Up!" he shouted towards his rail, showing . A miracle ace of spades brought Ross a higher two pair, securing him his double. Ron Ware won a stud pot with pocket aces when Mike Ross correctly folded a smaller pair on fifth street, and then Ware made a jack-low in triple draw to knock Ross down to about 300,000. They got the rest of the money in before the first draw in triple draw, with Ross pulling two and Ware three. Both players then drew one on each of the last two draws. Ware turned over . Ross showed . "Show me what I've gotta beat," Ross said. If Ware pulled something lower than eight that didn't pair him, the tournament would end, but he turned over a . Ross needed to avoid a king, queen, or pair, and he turned over a to survive. Ron Ware defended his big blind against Mike Ross' raise from the button. 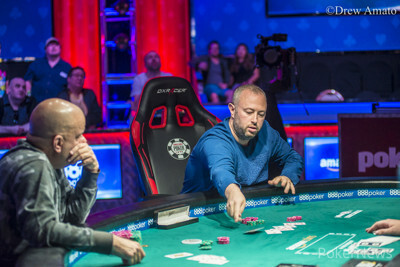 The flop fell and Ware let his opponent fire a continuation bet. Ross obliged but Ware decided to take the aggression to his hands. He check-raised to earn a call from Ross. Ross, however, didn't find a call button when Ware led the turn. Ware is now gaining the ground again, taking more than four-to-one lead. Players have agreed to a 10-minute break.